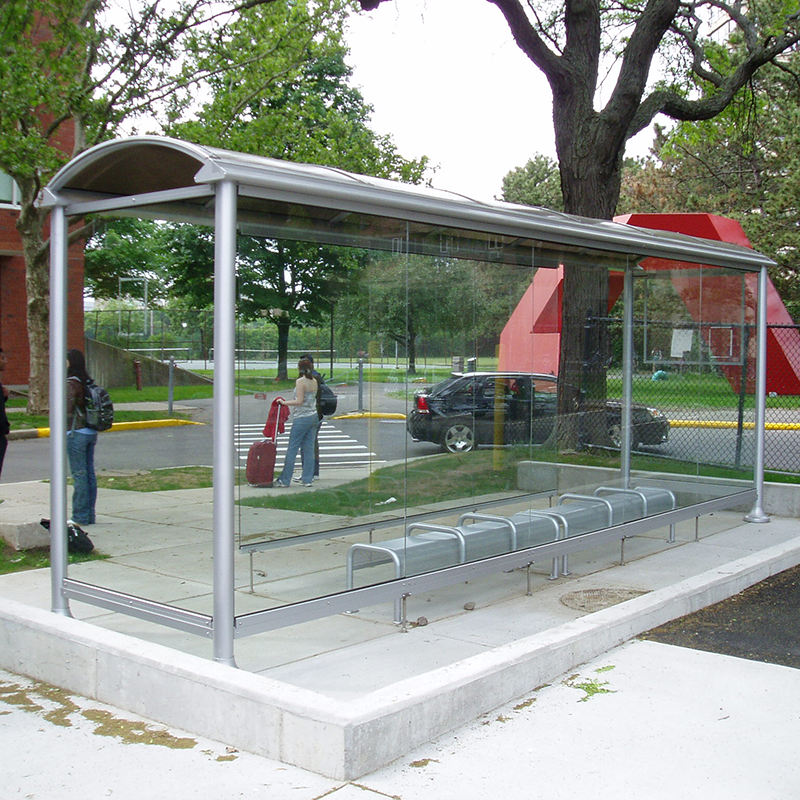 The perfect fit for modern cosmopolitan communities and bus rapid transit projects. 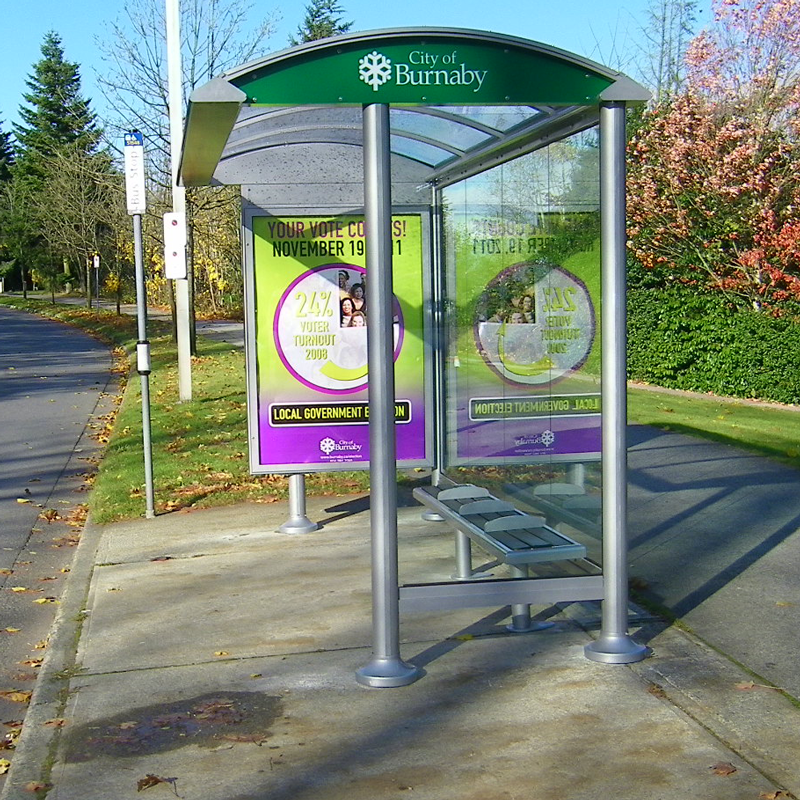 Our Euro Transit Series is sleek and stylish yet strong and sturdy. 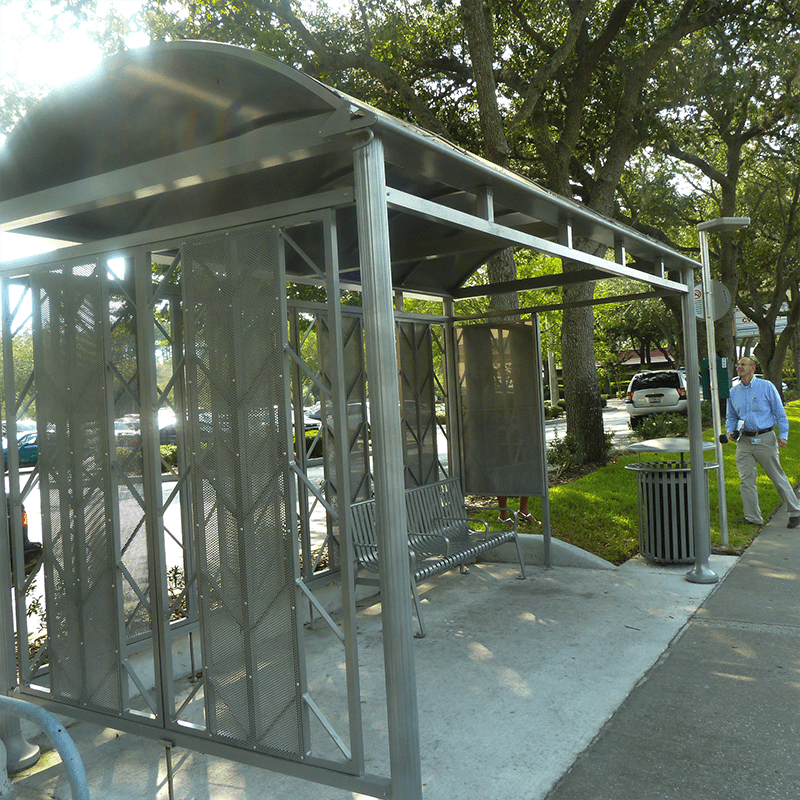 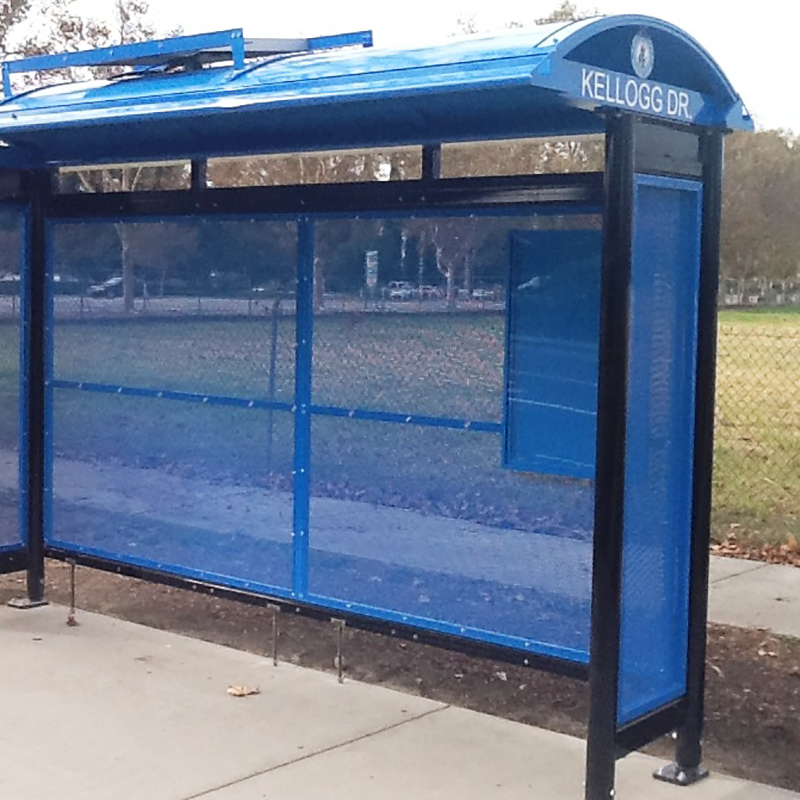 This combination of design and durability results in a highly functional transit shelter with eye-catching designs that your community will warmly welcome to its public streetscape. 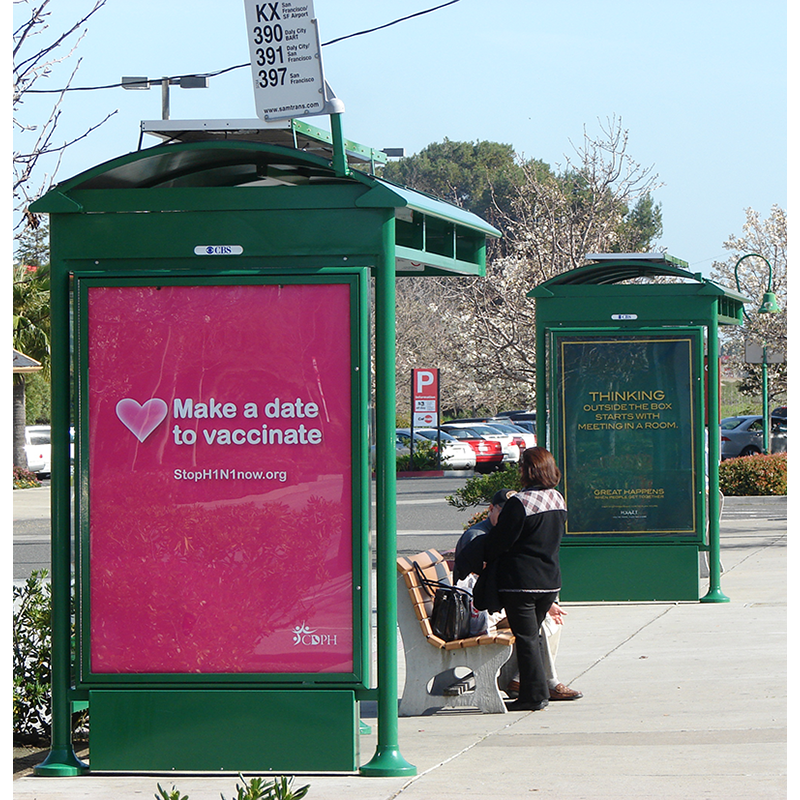 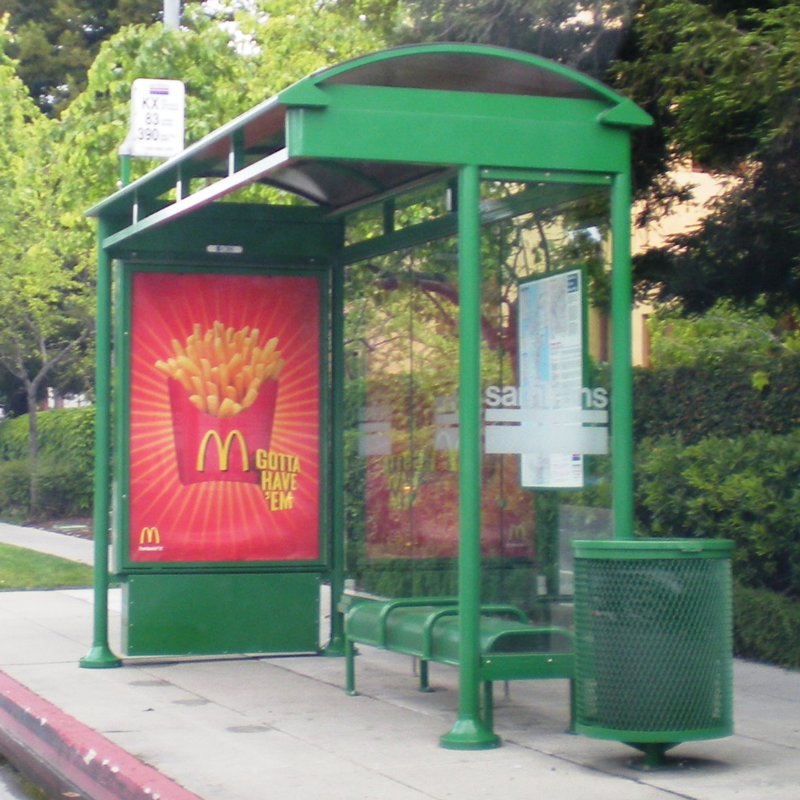 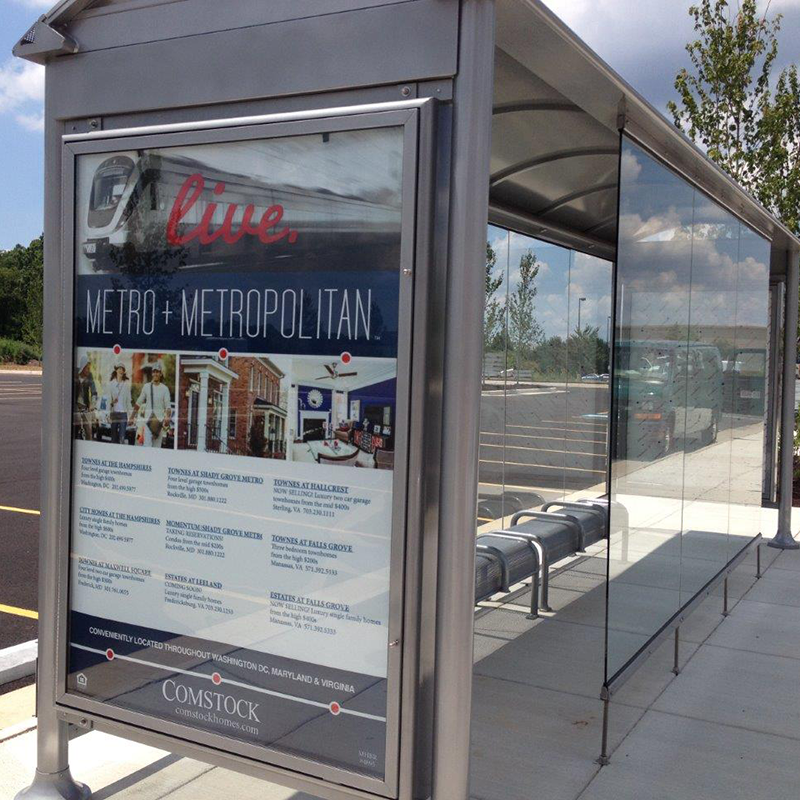 And, you can trust that our experienced engineers will ensure all of your bus shelter design specifications are incorporated into the finished product, whether that’s a need for solar-power illumination, digital or static information/advertising displays, custom color matching or special weather resistant materials. 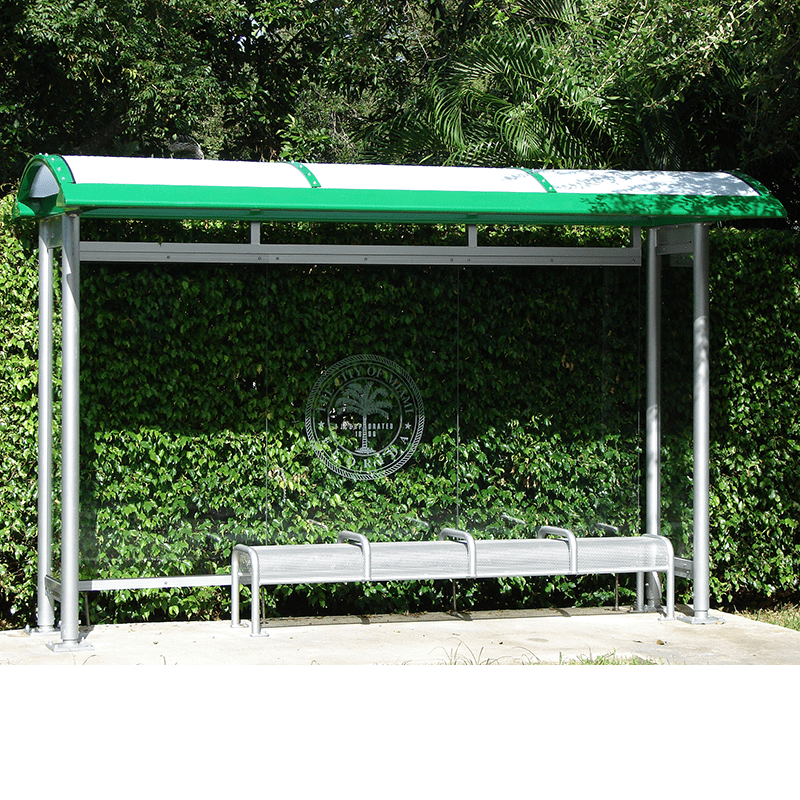 Cutting-edge looks combined with unsurpassed craftsmanship, that’s what you can expect from our innovative Euro Transit Series shelters. 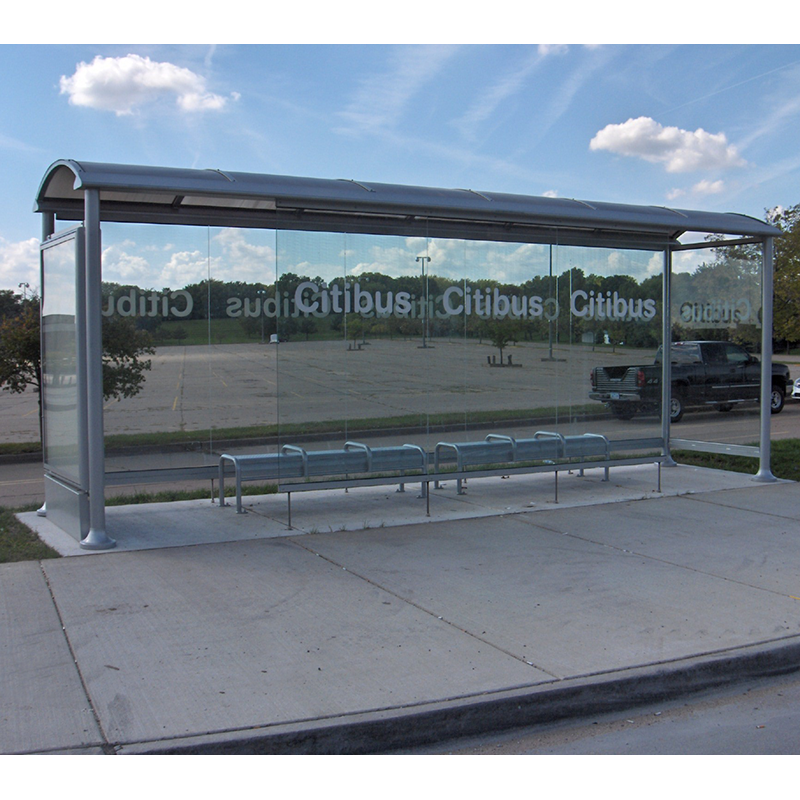 13′ Euro Max Roof Non-Advertising bus shelter featuring: white lexan roof panels, with 3/8″ glass walls, aluminum support posts, city logo on rear glass, and 8′ perforated metal bench with three anti-vagrant bars. 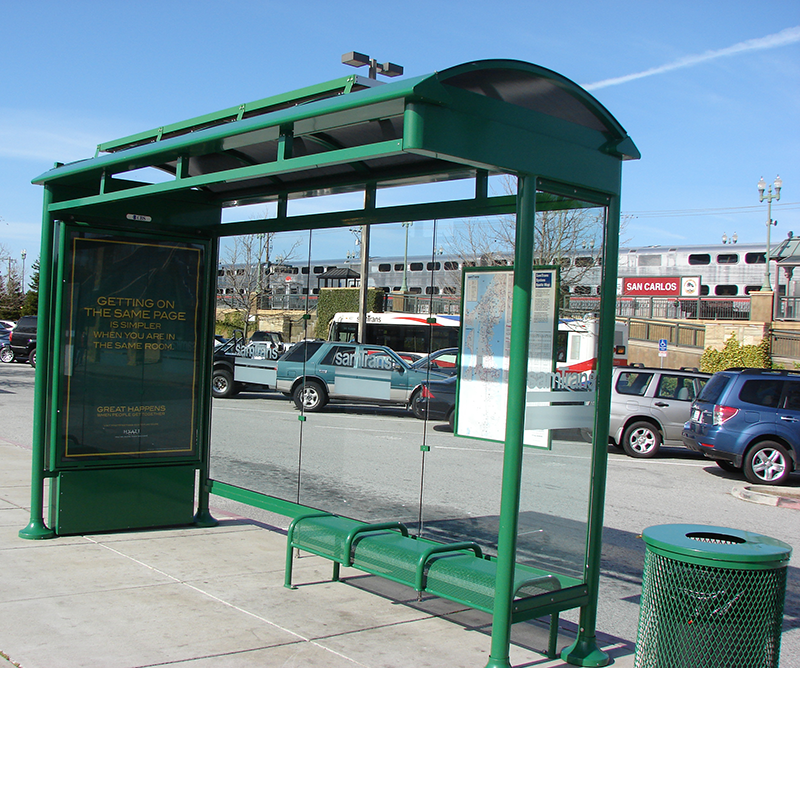 14′ Euro Roof Non-Advertising bus shelter featuring: bronze lexan roof panels, supported by custom posts with escutcheons, custom agency branded glass, and 5’ perforated metal bench. 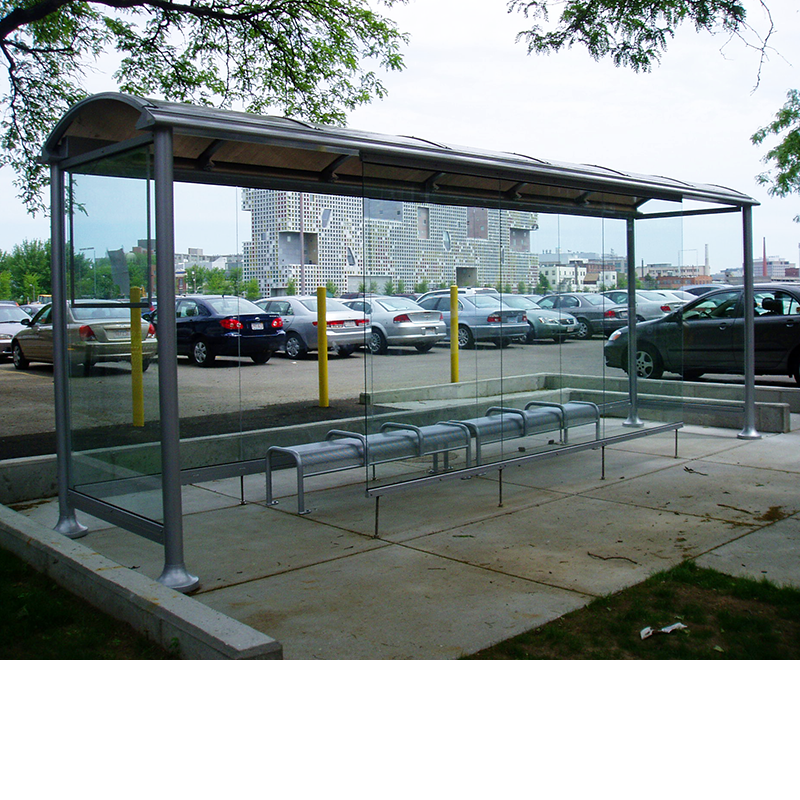 22′ Euro Roof Non-Advertising bus shelter featuring: bronze lexan roof panels supported by custom posts with escutcheons, 3/8″ clear glass at the rear, end and front walls, and perforated metal bench. 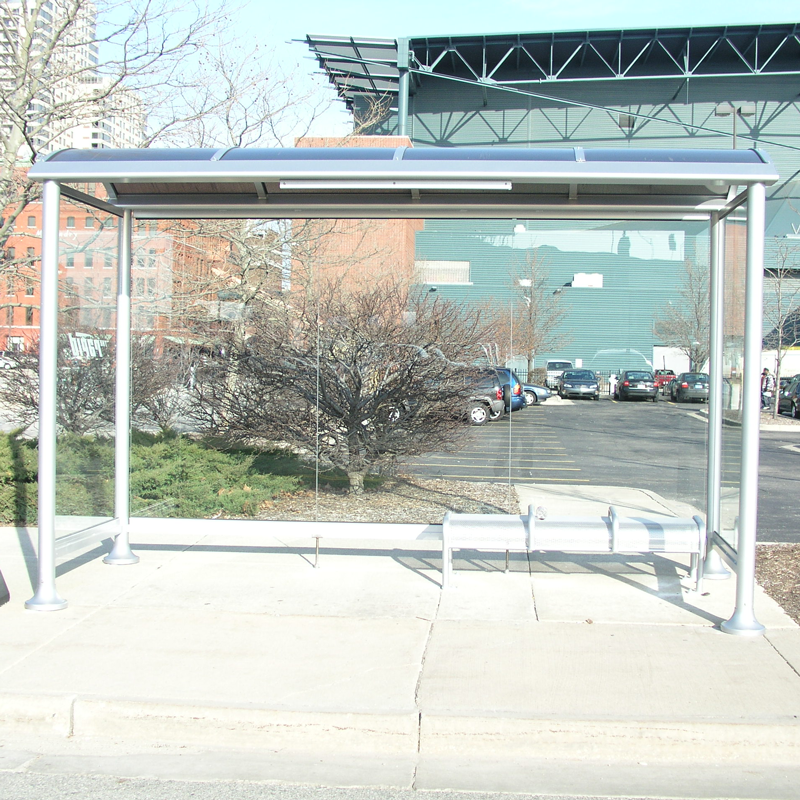 Shown with LED solar lighting. 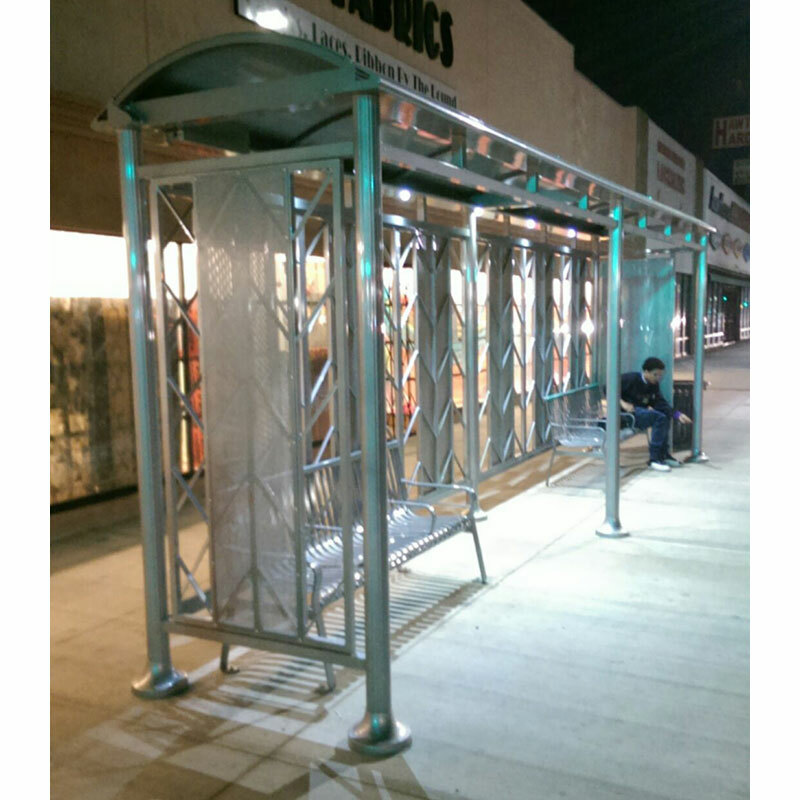 13′ Euro Roof Non-Advertising bus shelter featuring: aluminum roof panels, perforated metal walls, city logos and location plaque along with dusk to dawn LED solar illumination, and an integrated map case. 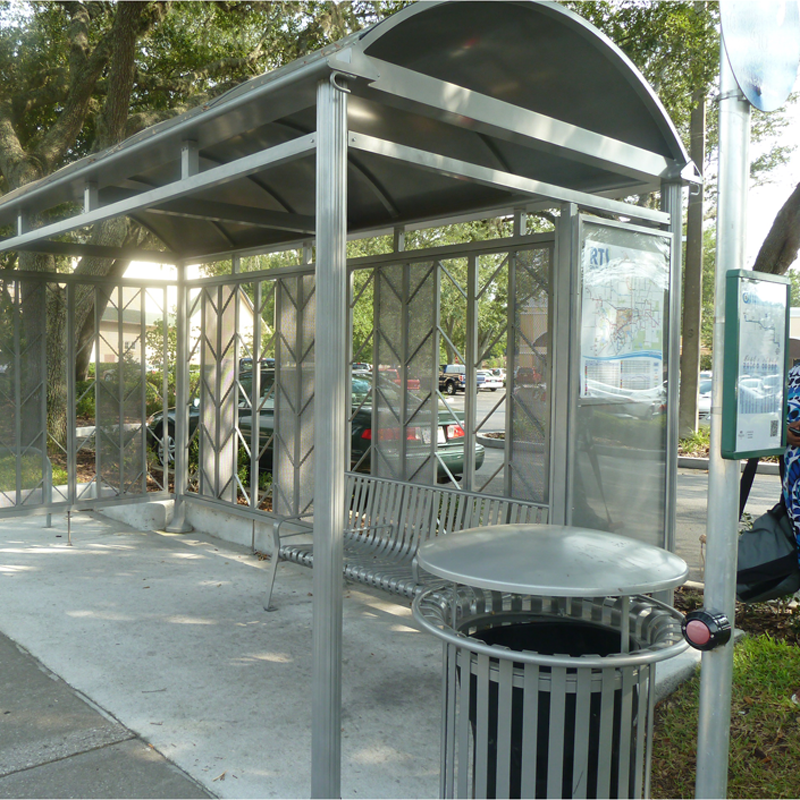 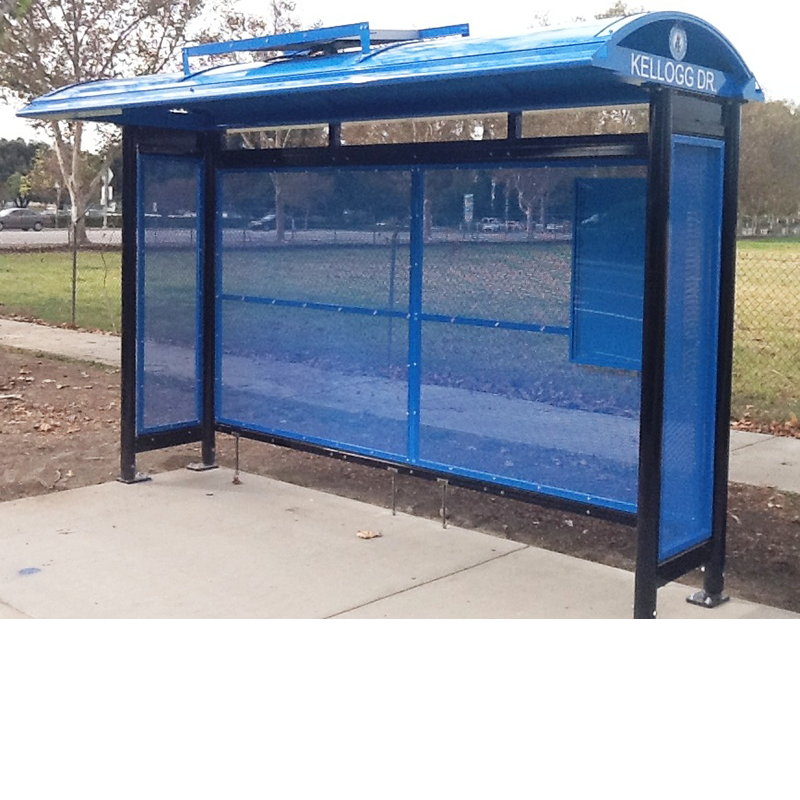 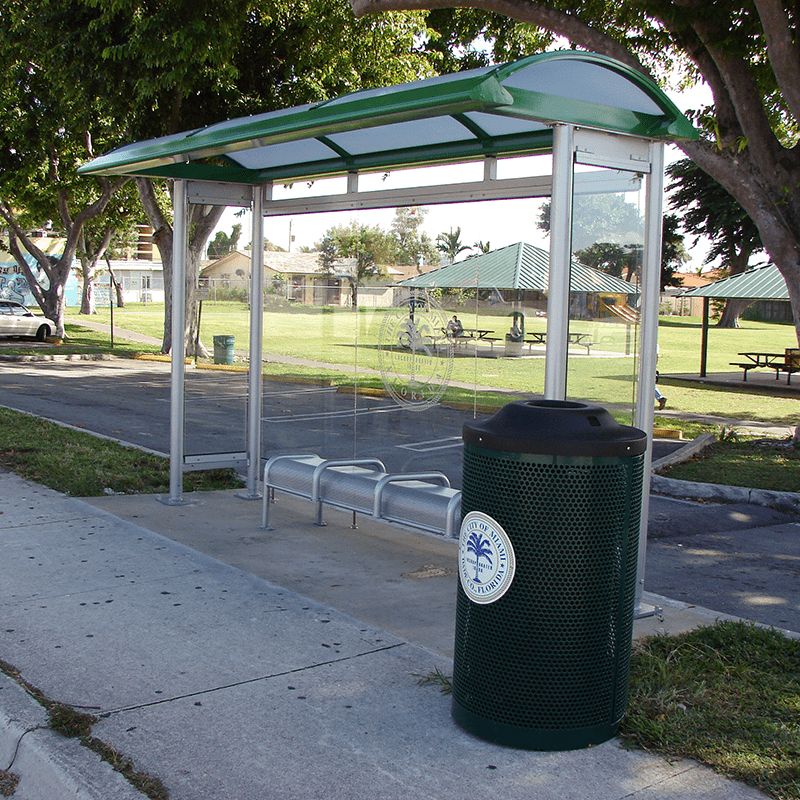 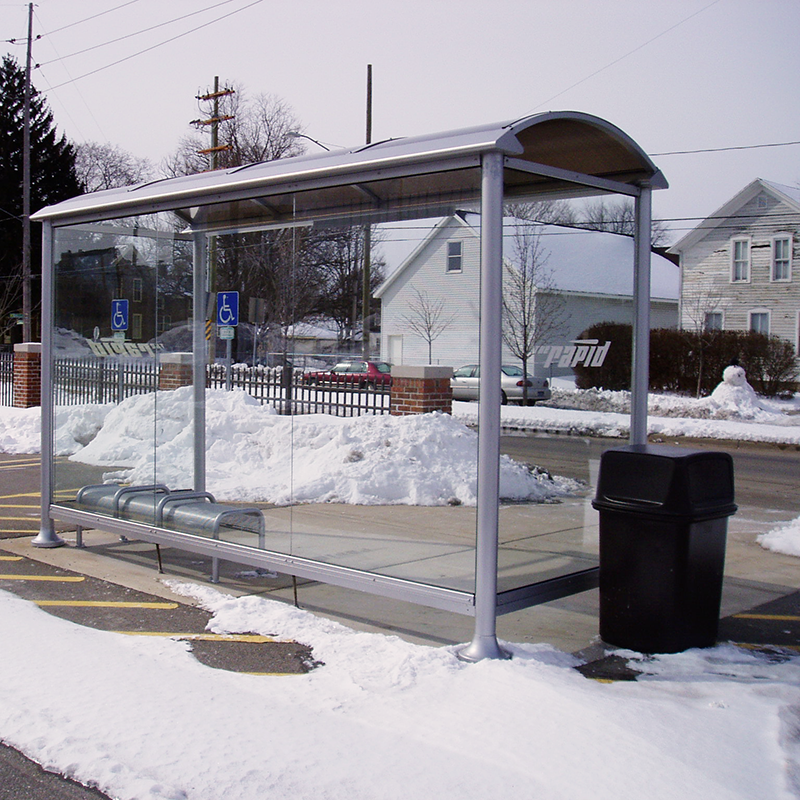 16′ x 8′ Euro Roof Non-Advertising bus shelter featuring: bronze lexan roof panels supported by custom posts with escutcheons, herringbone design rear and end panels, integrated map case, steel strap street bench, and trash receptacle. 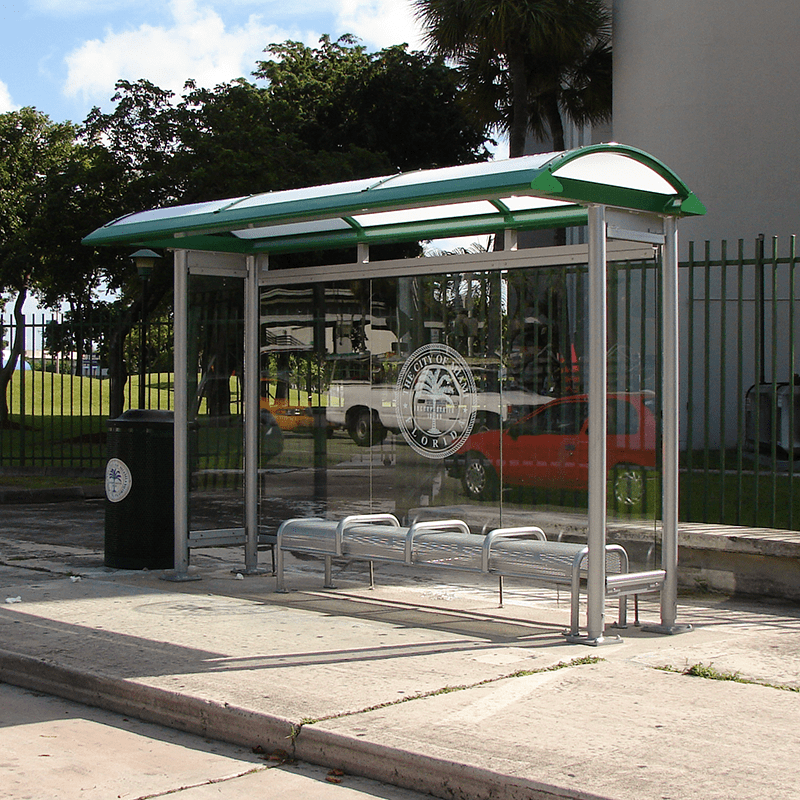 9′ Euro Roof Non-Advertising bus shelter featuring: bronze Llexan roof panels supported by custom posts with escutcheons, custom agency branded glass, and a perforated metal bench. 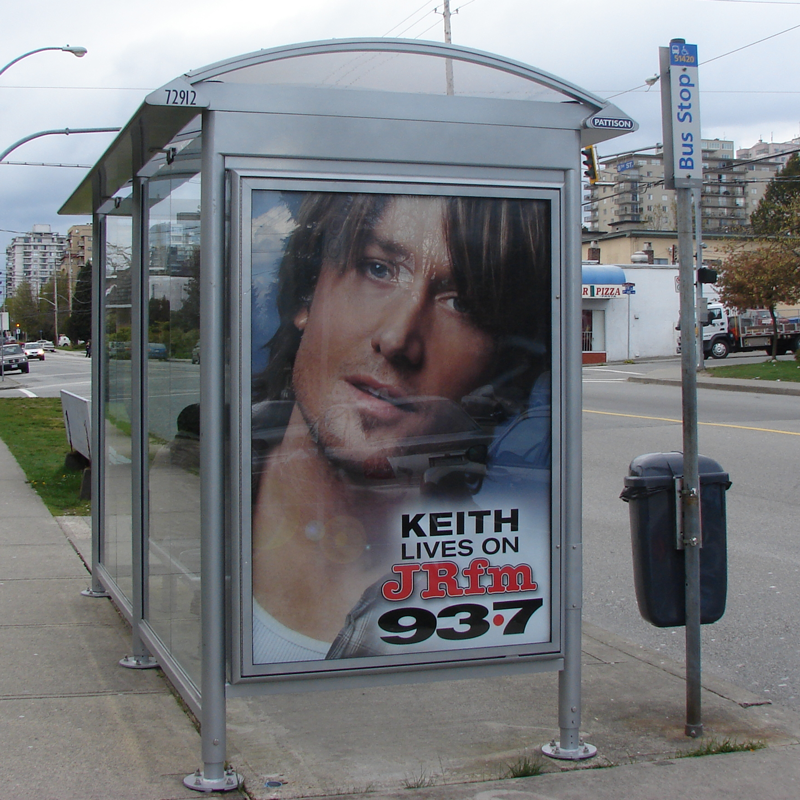 10′ Euro Advertising Bus Shelter featuring: bronze lexan roof panels, integrated gutter, drain and leaf catcher, back-to-back LED illuminated advertising kiosk, LED roof lighting, 3/8″ glass walls, standard aluminum support posts with escutcheons, and 5’ perforated metal bench with two anti-vagrant bars. 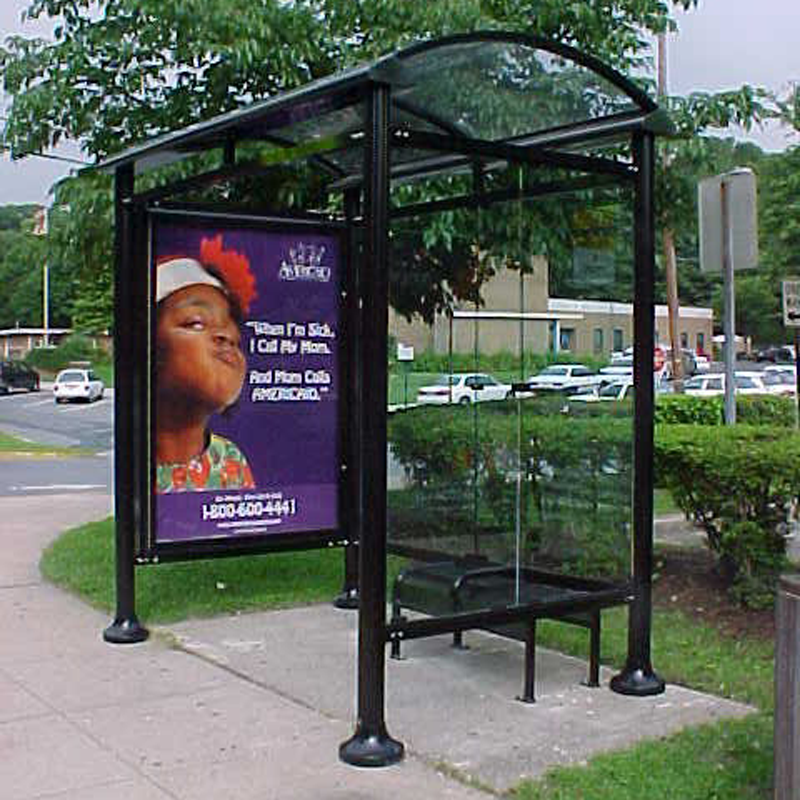 22′ Euro Advertising Bus Shelter featuring: aluminum roof panels, integrated gutter, drain and leaf catcher, cold weather block-offs, two back-to-back LED illuminated advertising kiosks, LED roof lighting, aluminum support posts, 3/8” clear glass at the rear and partial front walls, and perforated metal benches. 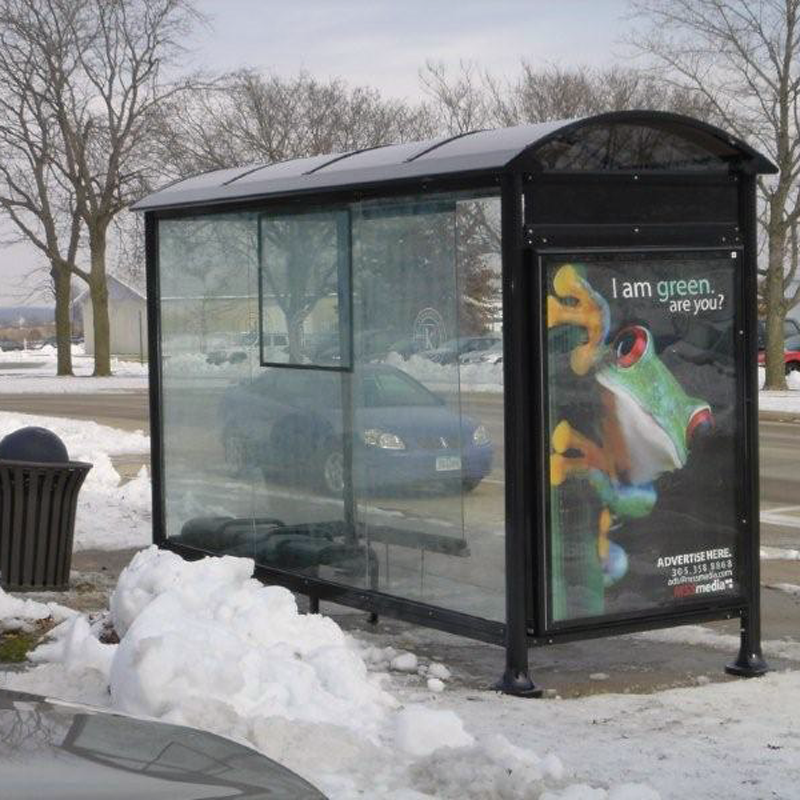 13′ Euro Advertising Bus Shelter featuring: bronze lexan roof panels, integrated gutter, drain and leaf catcher, and back-to-back LED illuminated advertising kiosk. 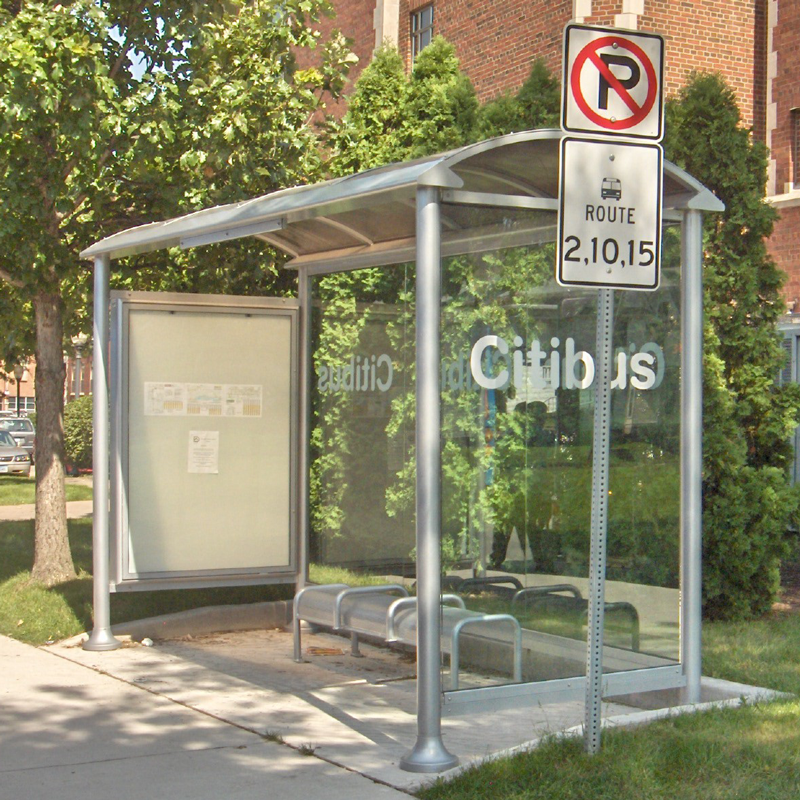 Also, includes LED illuminated, City-branded signage at each roof end. 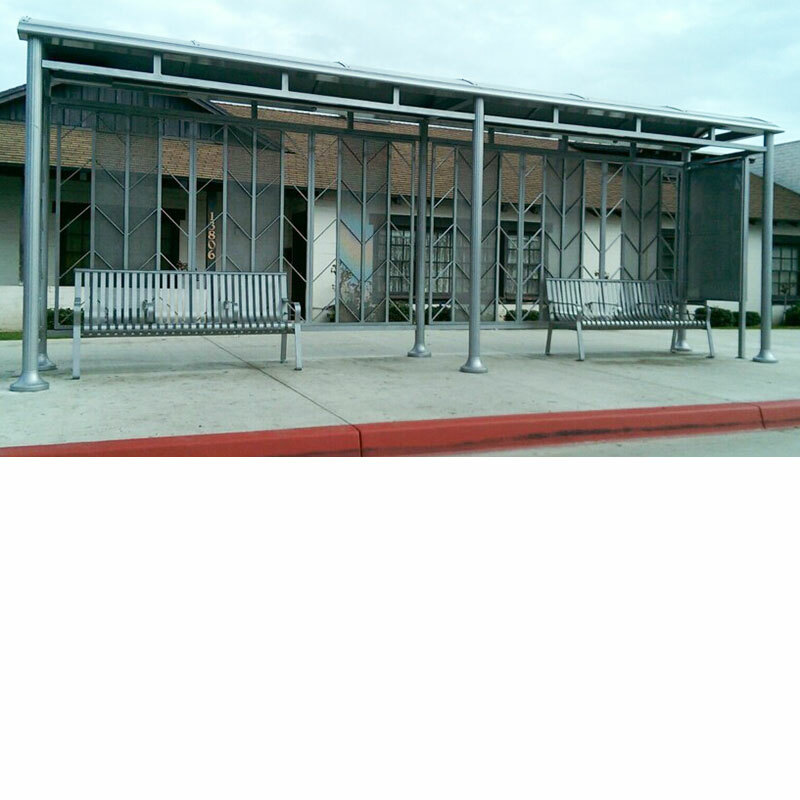 Show with LED roof lighting, 3/8″ glass walls, standard aluminum support posts with escutcheons, and 88” aluminum frame recycle slat bench with anti-vagrant bars. 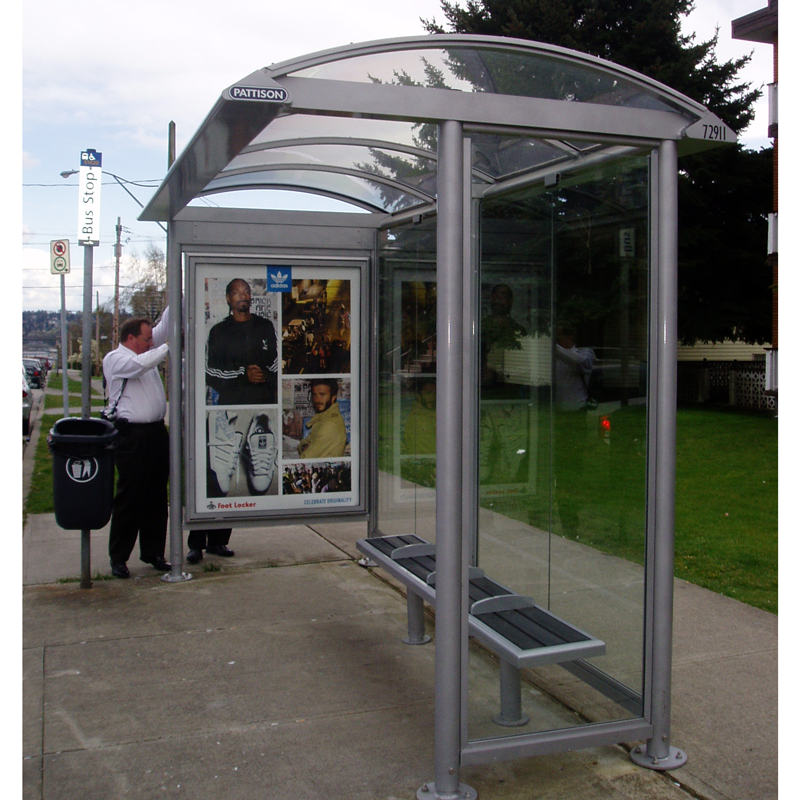 13′ Euro Advertising Bus Shelter featuring: bronze lexan roof panels, integrated gutter, drain and leaf catcher, back-to-back solar illuminated advertising kiosk at the rear of the shelter, solar led roof lighting, branded frit 3/8″ glass walls, integrated map case, standard aluminum support posts with escutcheons, and 6′ perforated metal bench with 2 anti-vagrant bars. 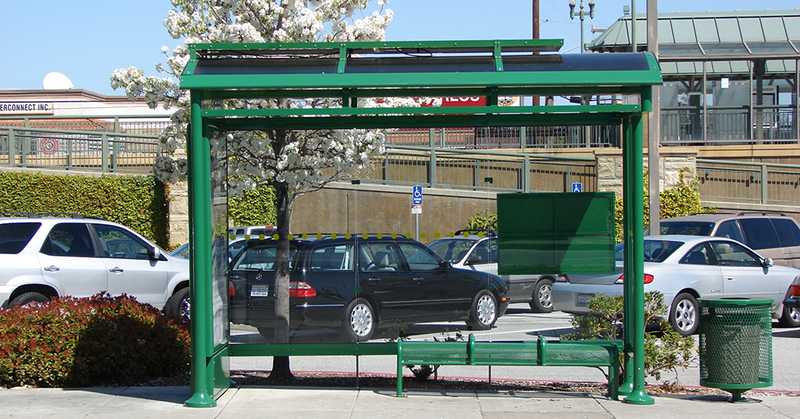 13′ Euro Advertising Bus shelter featuring: wide roof option, integrated gutter, drain and leaf catcher, clear acrylic roof panels, back-to-back LED illuminated advertising kiosk, aluminum support posts, 3/8″ glass walls, and 88″ extruded aluminum framed recycle slat bench with anti-vagrant bars. 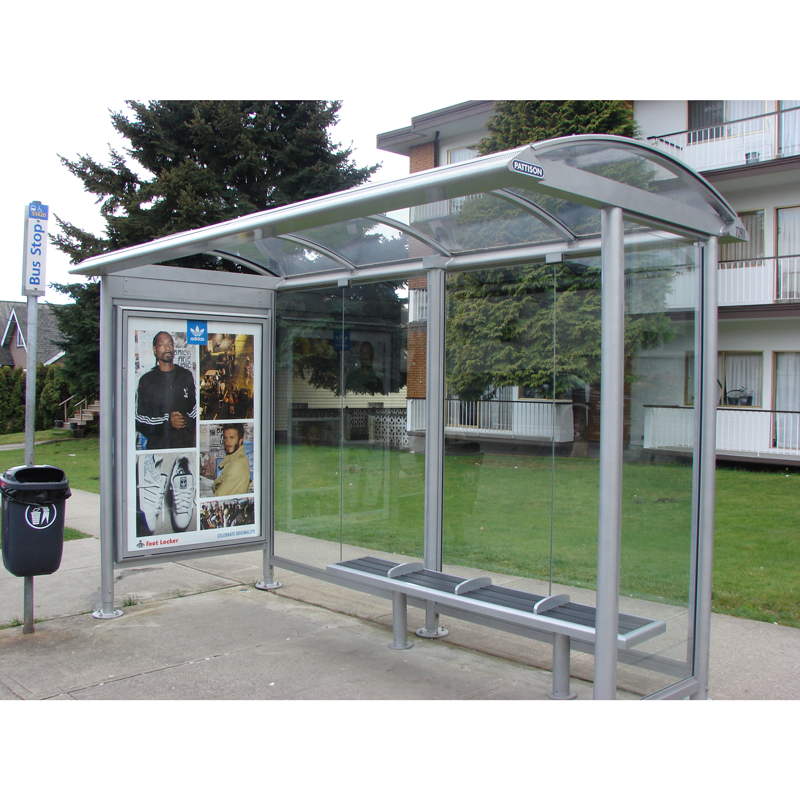 14′ Euro Advertising Bus Shelter featuring: bronze lexan roof panels, back-to-back illuminated advertising kiosk, fluted support posts with escutcheons, custom frit 3/8″ glass walls, rear wall map case, and 6′ perforated metal bench with anti-vagrant bars. 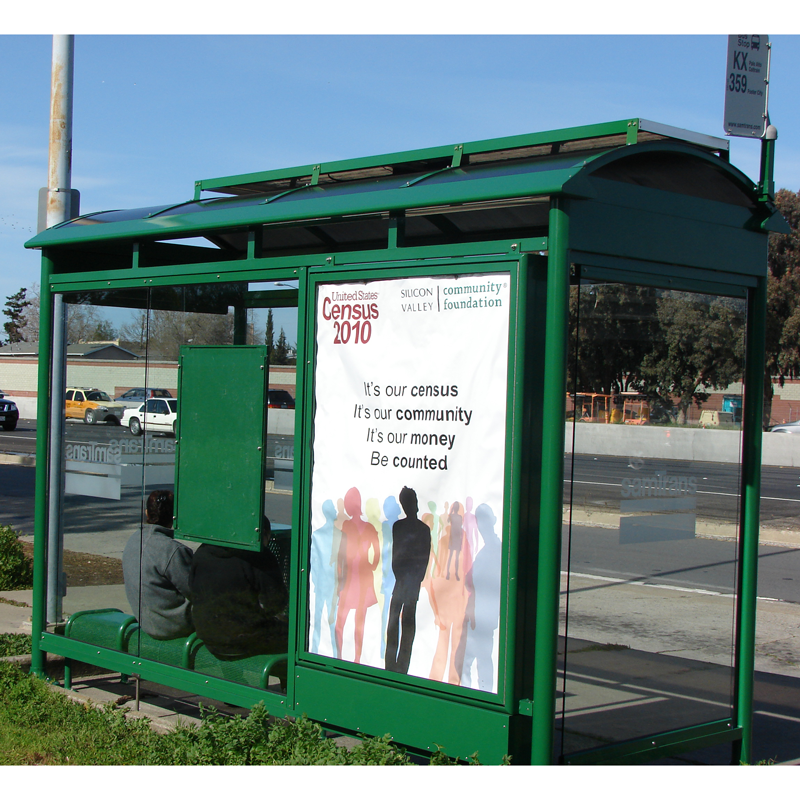 22′ Euro Advertising Bus Shelter featuring: bronze lexan roof panels, flat back-to-back solar powered LED illuminated advertising kiosk, 3/8” custom agency branded glass, partial 3/8” clear glass front wind screen, and two 6’ perforated metal benches. 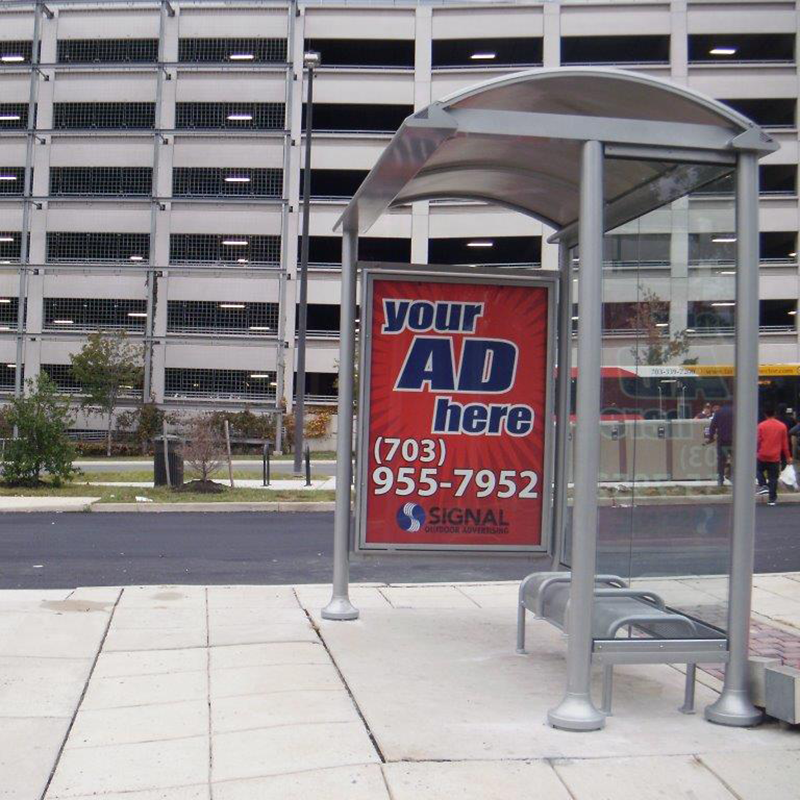 22’ High Capacity Euro Advertising Bus Shelter featuring: bronze lexan roof panels, back-to-back LED illuminated advertising kiosk with 3/8” clear glass walls, and 6’ perforated metal bench. 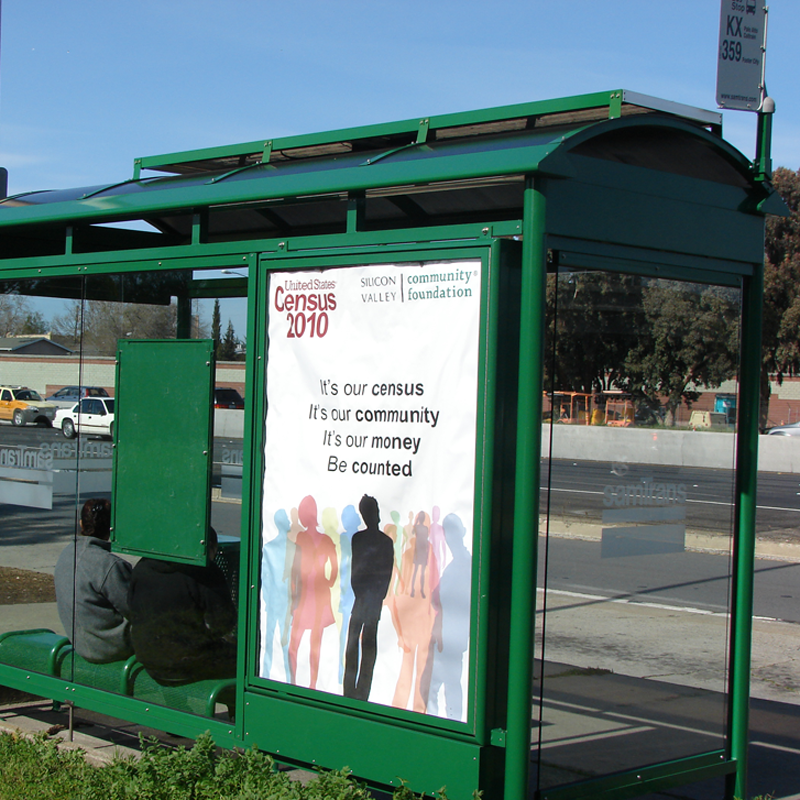 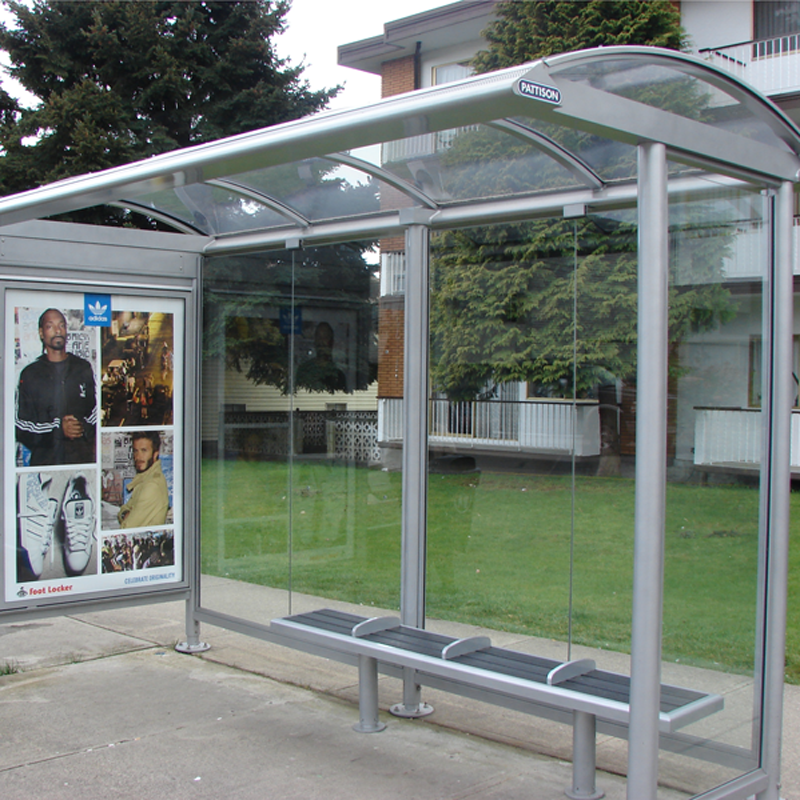 10’ Euro Advertising Bus Shelter featuring: clear lexan roof panels, back-to-back illuminated advertising kiosk, fluted aluminum support posts with escutcheons, 3/8″ glass walls, and 40″ perforated metal bench with anti-vagrant bar. 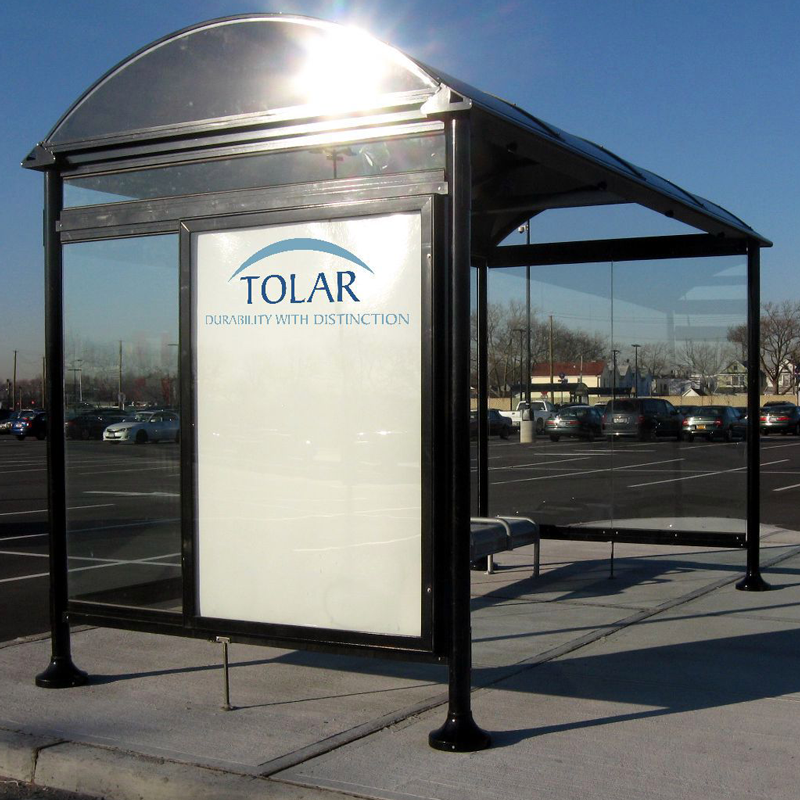 13′ Euro Advertising Bus Shelter featuring: bronze lexan roof panels, back-to-back solar illuminated advertising kiosk, solar led roof lighting, and branded frit 3/8″ glass walls. 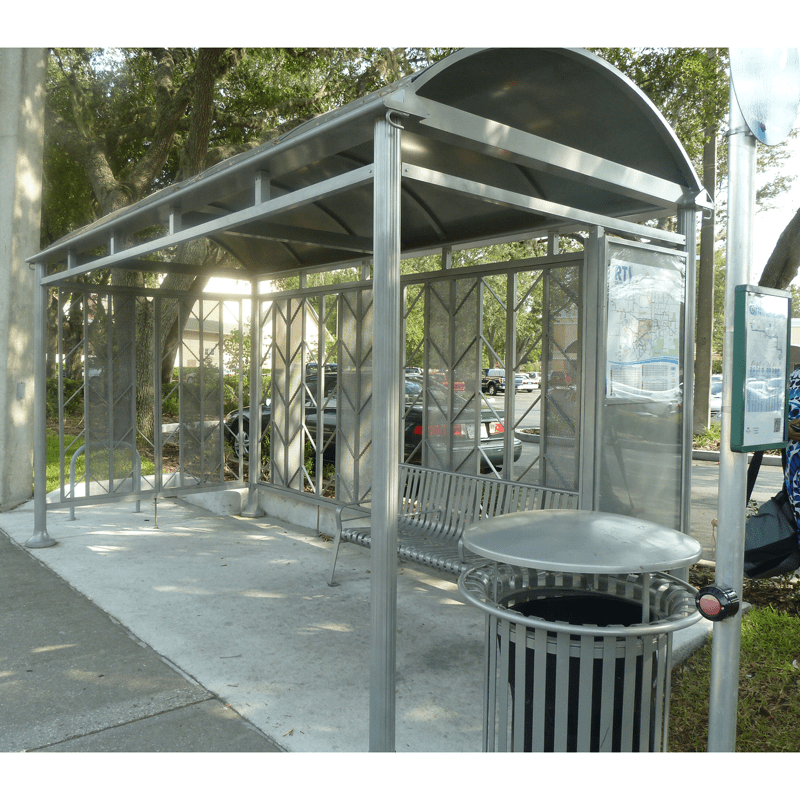 Also includes integrated map case, aluminum support posts with escutcheons, 6′ perforated metal bench with 2 anti-vagrant bars, and 32 gallon expanded metal trash receptacle. 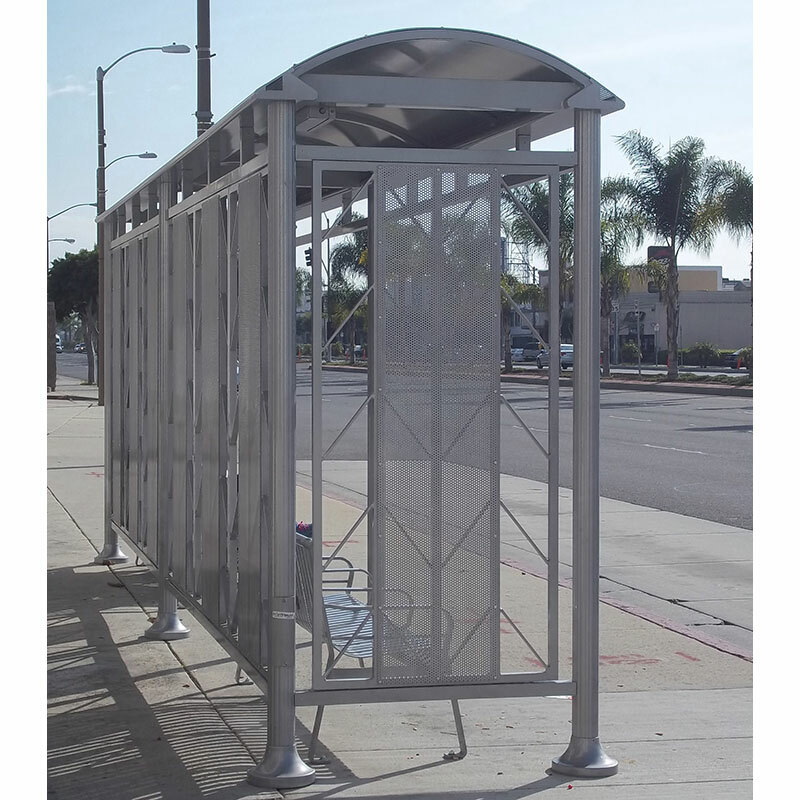 13′ Euro ‘Max’ Advertising Bus Shelter featuring: white lexan roof panels, aluminum support posts, back-to-back solar illuminated advertising kiosk, 3/8″ glass walls, and 8′ perforated metal bench with 3 anti-vagrant bars.